Artwork seems in awfully good shape, considering the rest of it, and having been exposed to the elements for decades. Was Steven Tyler born in it or something ???? It's in better shape than Steven Tyler. No... that's him standing by the rear wheel. Mike may have over paid. He let his Sweet Emotions get the better of him. 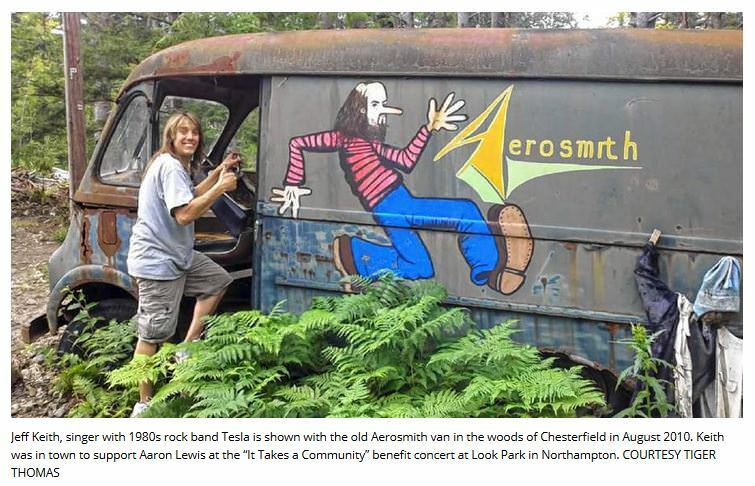 The original Aerosmith tour van that rested in the woods of Chesterfield was a well-kept secret from most residents. Select Board member Robert Recos and his wife, Nancy, however, accidently became aware of the iconic vehicle more than 30 years ago. I just read about this. Pretty interesting but there's no way I would pay 25K for that! How are they going to tow it out of there without it ripping in half? E trac and an equinox 800 woowhoo! lol,...I know,...it was my attempt at smurky sarcasm. I don’t think it’s their bus because it’s not riddled with bullets from machine guns. Those guys were very primitive in their younger days according to Tyler’s ex. Supposedly, bored, they’d spend days shooting firearms out from inside their current dwelling at the time. With a little duct tape . . .
Its that lead paint, lasts forever! Aerosmith , one of the most popular and influential rock bands of all time. I bet they turn around and sell it for many times what they paid for it. Not that its worth that , but you know there are some wealthy fans out there that will pay up for something like this even if it is just a rusty piece of junk. American pickers makes me laugh, like we can not figure out it is staged. They door knock and the owners say "come in" like they just met but there is a camera guy in the house already. They were at a local antique shop years ago and the owner was on the news afterward explaining how it was set up months in advance including what items were there and all the facts about them including the price. As for the van, it is hard to believe the pictures were painted that long ago.....looks too good. OK, but why is there zero underlying rust coming through? Look all around the graphic, rust everywhere, except the painted surface. She’d better be careful, who knows what’s living in that old bus! Spectacular! I'm sure it's not the first time Jeff has been called "she" though. Also very true. Could be any crusty old roadie in the back of that thing.